Plectosporium blight (previously named Microdochium blight) is a new, potentially devastating disease. 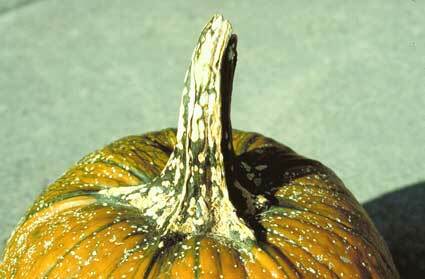 Pumpkin, squash (especially zucchini) and gourd are susceptible. It was first observed in the USA in the late 1980s. It is believed to have occurred in MD in 1987. The first confirmed report was TN in 1988. It was first seen in New England (MA) in 1999. Since 1988, Plectosporium blight has been reported in GA, AL, LA, NC, KY, VA, MD, DE, NJ, PA, IN, IL, OH, CT, MA, and most recently, NY. Several NY growers commented that they thought it had occurred on their farm after they saw photographs of symptoms during extension meetings in early 2004. Symptoms of Plectosporium blight were confirmed on pumpkin and zucchini squash plants in eastern NY in Aug 2004 (http://www.apsnet.org/pd/searchnotes/2005/PD-89-0432A.asp) and in Oct 2004 on pumpkin fruit brought on to Long Island to restock pick-your-own fields. In 2000, the first year Plectosporium blight was observed in IL, symptoms were found in all pumpkin fields examined and yield loss was as much as 50%. Severe losses occurred in 2003 in CT and MA, where the disease was confirmed on 7 farms and in several home gardens, probably because rainy weather provided favorable conditions. Two of these farmers reported total loss of their squash (yellow and zucchini) and pumpkin crops. Once observed in a state, Plectosporium blight usually has reappeared in following years, unless weather is unfavorable for disease development. It now occurs routinely throughout TN and VA. Plectosporium blight can disappear after conditions become dry because the pathogen is highly dependent on rainfall. Spores of this pathogen are dispersed by wind and rain. This pathogen is thought to not be the same as the one occurring in Europe, but rather to be a mutant of this fungus (Plectosporium tabacinum) which is a common saprophyte often found on decaying vegetable debris. Symptoms occur on leaf veins, stems, and fruit (Figures 1 and 2). Lesions are white and have a very distinctive diamond to spindle shape that is characteristic for this disease. They are small initially (<1/4 inch), but can expand and coalesce, causing the entire surface of stems, leaf veins or fruit handles to turn white. Leaf tissue between veins is not affected, thus early symptoms are not as apparent as with other foliar diseases. Leaves eventually die and collapse, often in a 10- to 25-ft diameter circle around the site of initial infection. Dead vines can be so brittle they shatter when stepped on. Spots are more circular on fruit, and they remain small and don’t coalesce. Figure 1. Distinctive diamond to spindle shaped white lesions characteristic of Plectosporium blight on leaf veins, on a vine, and on a pumpkin fruit and handle (courtesy of Mary Ann Hansen, Virginia Polytechnic Institute and State University). Figure 2. Zucchini squash is very susceptible to Plectosporium blight (courtesy of Mary Ann Hansen, Virginia Polytechnic Institute and State University). Management begins with rotation because the pathogen can survive in soil. The minimum effective rotational period has not been determined; at least three years is recommended. 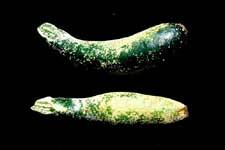 The pathogen is not thought to be seed-borne. Genetic resistance has not been detected, but differences in susceptibility have been documented among pumpkin varieties. An experiment conducted in TN in 2003 revealed that Sorcerer had fewer unmarketable fruit (50%) while Gold Strike had the most (85%). Other varieties in this experiment were Howden, Magic Lantern, Howdy Doody, Aladdin, Mother Lode, Autumn King, Gold Standard and Big Autumn. Since disease development requires leaf wetness, irrigate with drip. If that is not feasible, time overhead irrigation to minimize leaf wetness. Scout fields after rainy weather. 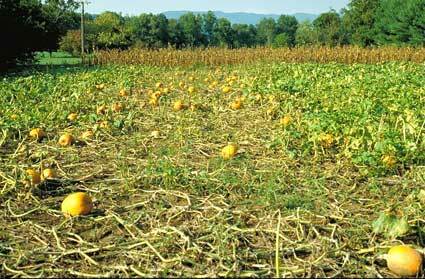 Carefully inspect any pumpkin fruit brought onto your farm to re-stock pick-your-own fields. Affected fruit typically do not breakdown and the spots could be mistaken to be oedema or another non-pathological blemish. Fungicides presently available for use in NY are Dithane DF Rainshield, Bravo, Cabrio, Flint, and Amistar. Since Plectosporium blight is a new disease in the US, it is not on the label of most fungicides registered for use on this crop group and demonstrated to be effective for Plectosporium blight. The target pest as well as the crop must be specified on a pesticide label for the product to be legally used in NY. Plectosporium blight is specified on the Dithane and Cabrio labels. Unfortunately Dithane is not labeled for use on pumpkin, which is one of the more susceptible crops. NYS Department of Environmental Conservation granted FIFRA 2(ee) requests to add Plectosporium blight to the labels for Bravo, Amistar, and Flint in 2004. Click on ‘EPA Reg. Number’ under ‘Search for Products by’. Enter the registration number for one of the three fungicide names. Click on ‘details’ in the right column. Look under ‘Document Type’ for ‘2EE’. Click on the corresponding label /Document ID. Bravo and Dithane are the primary fungicides recommended for Plectosporium blight. These were as effective as the QoI (aka strobilurin) fungicides Cabrio, Flint and Quadris in an experiment conducted in GA in 2001 (see Table 1). Bravo has also been effective in other university fungicide evaluations. Chlorothalonil fungicides have provided effective control in commercial production fields as well (Figure 3). Figure 3. Plectosporium blight was controlled in this field with regular applications of chlorothalonil as demonstrated by the section in the center of this photograph that was missed by the spray boom (courtesy of Mary Ann Hansen, Virginia Polytechnic Institute and State University). QoIs have only been recommended for Plectosporium blight when other labeled diseases (e.g. powdery mildew, downy mildew, gummy stem blight/black rot) were also occurring because of the high risk of selecting resistant strains of these or another pathogen that is also present. Unfortunately, utility of QoIs for disease control in cucurbits has been reduced by development of resistant strains of the powdery mildew and black rot pathogens, which have been associated with control failure. The QoI recommended in 2005 for powdery mildew and black rot is Pristine because it contains an additional active ingredient effective for these diseases (boscalid). Pristine is not registered to control Plectosporium blight per se, but it contains the same active ingredient (pyraclostrobin) that is in Cabrio, a product that is registered for control of the disease. While Pristine has not been evaluated yet for Plectosporium blight, applying Pristine for powdery mildew may control Plectosporium blight based on the fact that the highest labeled rate for Pristine has the same amount of active ingredient (pyraclostrobin) as the lowest rate of Cabrio, which has been shown to be effective for this disease in university experiments and is labeled for this use. A 7-day fungicide application interval is recommended during rainy weather. Plectosporium blight was significantly more severe in pumpkins sprayed every 14 days than those sprayed weekly when conditions were favorable in an experiment conducted in MD. Development of Plectosporium blight is highly dependent on rainfall. Thus the interval can be extended during dry weather. This disease has been observed to disappear under dry conditions. 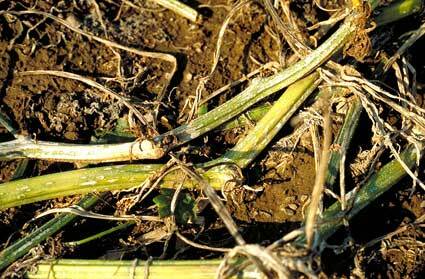 In a rotated field, begin applying fungicides for Plectosporium blight when powdery mildew starts to develop. This timing has worked well in fungicide efficacy experiments conducted in MD. Start at flowering or fruit set where scouting is not done. Start applications shortly after crop emergence when planting into a non-rotated field that had Plectosporium blight the previous year as recommended in TN. A weekly spray program has been used in most fungicide efficacy experiments. Suggested Fungicide Program for Powdery mildew, Plectosporium blight, Black Rot and Other Pumpkin Diseases 2005. The fungicide program listed below includes a product each week that is effective for powdery mildew, Plectosporium blight and black rot. 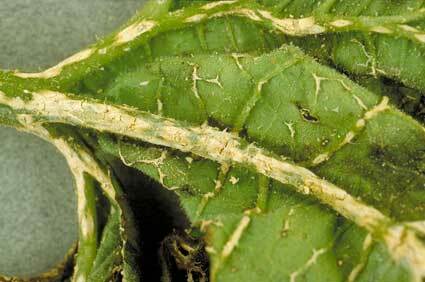 Begin when powdery mildew is detected at the action threshold of 1 leaf with symptoms out of 50 older leaves examined. If only powdery mildew is a concern, consider in place of Bravo either sulfur for all cucurbits except melon or mineral oil. Microthiol Disperss and JMS Stylet-oil were the most effective contacts tested in experiments conducted on LI. Note that Nova is also only effective for powdery mildew. Add copper if bacterial diseases are a concern. Additional fungicides recommended where Phytophthora blight and downy mildew occur are covered in other articles on these diseases at the Vegetable MD Online web site and in the Cornell Integrated Crop and Pest Management Guidelines for Vegetables. Week 1 Pristine + Bravo or another chlorothalonil product. Week 2 Nova + Bravo. Week 3 Pristine + Bravo. Week 4 Bravo. Add Nova if little powdery mildew on leaf underside and couple more weeks of powdery mildew control desired. Bravo could be used alone if additional sprays are needed. The specific directions on fungicide labels must be adhered to -- they supersede these recommendations, if there is a conflict. Table 1. Plectosporium blight severity and percent control achieved with several fungicide programs evaluated in six efficacy experiments. y Number of applications and time period when they were made. TN, 2001, severity rating is % stem area affected. Control of defoliation was 98-100% for these treatments (full report in Fungicide &Nematicide Tests 57:V136). MD, 1999, severity rating pertains to fruit (F&N55:V244). MD, 2000, severity rating is % blight (F&N56:V68). MD, 2001, severity rating is % leaves, vines, and peduncles affected (F&N57:V80). GA, 2001, severity rating is infestation of crown + stems on a 0 to 10 scale (F&N57:V83). GA, 2002, severity rating is total stem and handle area affected (F&N58:V84).